Krypton is chemical element number 36 on the periodic table of the elements. It belongs to the group of elements known as the noble gases. The other noble gases are helium, neon, argon, xenon, and radon. Under normal conditions, krypton is a colorless, tasteless, odorless gas. Its density at normal temperature and pressure is about 0.5 oz per gallon (3.7 g per liter), making it nearly three times heavier than air. At extremely low temperatures, krypton may exist as a liquid or a solid. The boiling point of krypton is -243.81° F (-153.23° C), and its freezing point is only slightly lower at -251.27° F (-157.37° C). Krypton can also exist as an unstable, radioactive isotope. These isotopes are created during nuclear reactions. About 20 radioactive isotopes of krypton have been produced. All of these isotopes except krypton-85 are very unstable, with half-lives of a few hours or less. (The half-life of a radioactive substance is the time required for half of the atoms in a sample of the substance to undergo radioactive decay.) Krypton-85, which has 36 protons and 49 neutrons, is much more stable, with a half-life of 10.73 years. Krypton is used with argon in fluorescent lights to improve their brightness and with nitrogen in incandescent lights to extend their lifetime. It is also used in flashbulbs to produce a very bright light for a very short period of time, for use in high-speed photography. Radioactive krypton-85 can be used to locate small flaws in metal surfaces. The gas tends to collect in these flaws and its radioactivity can be detected. The noble gases were completely unknown to humanity until fairly recently. The first hint of their existence came in 1785, when the English chemist Henry Cavendish discovered that air contained a small amount of an unknown substance that was less reactive than nitrogen. Nothing else was known about this substance until the late nineteenth century. Meanwhile, the British astronomer Joseph Norman Lockyer discovered a new element in 1868. By analyzing light from the sun, he detected an unknown element that he named helium, from the Greek word helios (sun). Helium was not known to exist on Earth for more than a quarter of a century. Filtered air is compressed under high pressure, raising its temperature. The compressed air is then coded by rapidly expanding within a chamber. This sudden expansion absorbs heat from the coils, cooling the compressed air. The process of compression and expansion is repeated until most of the gases present in the air are transformed into liquids. chemist William Ramsay discovered a difference in the density of nitrogen obtained from the air and nitrogen obtained from ammonia. They soon discovered that the atmospheric nitrogen was mixed with a small amount of an unknown substance. By using magnesium to absorb the nitrogen, they were able to isolate the substance, which they named argon, from the Greek word argos (inactive), because it did not react with other substances. In 1895, Ramsay and his assistant Morris William Travers discovered that the mineral clevite released argon and helium when heated. This was the first time helium was detected on Earth. In 1898, Ramsay and Travers obtained three new elements from air, which had been cooled into a liquid. They named these elements krypton, from the Greek word kryptos (hidden); neon, from the Greek word neos (new); and xenon, from the Greek word xenos (strange). In 1900, the German chemist Friedrich Dom noted that the radioactive element radium released helium and an unknown radioactive gas as it decayed. In 1910, Ramsay and his assistant Robert Whytlaw-Gray determined the density of this unknown gas and named it niton, from the Latin word nitere (to shine), because its radioactivity caused it to glow when cooled to a liquid. Niton, later known as radon, was the last noble gas to be discovered. In 1904, Ramsay was awarded the Nobel Prize in Chemistry for his research of noble gases. The noble gases were formerly known as the rare gases or the inert gases. It was later shown that some were quite common and that some were not completely unreactive. Helium is the second most common element in the universe and argon makes up about 1% of Earth's atmosphere. In 1962, Neil Bartlett created xenon platinum hexafluoride, the first chemical compound of a noble gas. Compounds of radon were created in the same year and compounds of krypton in 1963. No longer thought of as rare or inert, these elements came to be known as the noble gases. Like the so-called noble metals (gold, silver, platinum, etc. ), they did not react with oxygen. Krypton played an important role in science from 1960-1983, when the length of the meter was defined as 1,650,763.73 times the wavelength of the orange-red light emitted by krypton-86. The meter was later defined in terms of the speed of light in a vacuum, but krypton continues to be used in scientific research. In order to separate krypton, as well as the other gases, from the liquid air, the air is slowly warmed in a process called fractional distillation. Operating under the assumption that each liquid has its own distinct temperature at which it changes to a gas, fractional distillation separates the gases within air one at a time. Although traces of krypton are found in various minerals, the most important source of krypton is Earth's atmosphere. Air is also the most important source for the other noble gases, with the exception of helium (obtained from natural gas) and radon (obtained as a byproduct of the decay of radioactive elements). At sea level, dry air contains 78.08% nitrogen and 20.95% oxygen. It also contains 0.93% argon, 0.0018% neon, 0.00052% helium, 0.00011% krypton, and 0.0000087% xenon. Other components of dry air include carbon dioxide, hydrogen, methane, nitric oxide, and ozone. Krypton can also be obtained from the fission of uranium, which occurs in nuclear power plants. Unlike air, which contains only the stable isotopes of krypton, this process produces both stable isotopes and radioactive isotopes of krypton. 1 Air is first passed through filters to remove particulate matter such as dust. The clean air is then exposed to an alkali (a strongly basic substance), which removes water and carbon dioxide. 2 The clean, dry air is compressed under high pressure. Because compression raises the temperature of the air, it is then cooled by refrigeration. 3 The cooled, compressed air passes through coils winding through an empty chamber. A portion of the air, which is compressed to a pressure about two hundred times greater than normal, is allowed to expand into the chamber. This sudden expansion absorbs heat from the coils, cooling the compressed air. The process of compression and expansion is repeated until the air has been cooled to a temperature of about -321 F (-196° C), at which point most of the gases in the air are transformed into liquids. 4 Gases with very low boiling points are not transformed into liquids and can be removed from the others directly. These gases include helium, hydrogen, and neon. 5 A process known as fractional distillation separates the various elements found in liquid air. This process relies on the fact that the different substances will be transformed from liquid to gas at different temperatures. 6 The liquid air is allowed to warm slowly. As the temperature increases the substances with the lowest boiling points become gases and can be removed from the remaining liquid. Argon, oxygen, and nitrogen are the first substances to be transformed into gases as the liquid air warms. Krypton and xenon have higher boiling points and remain in the liquid state when the other components of air have become gases. 7 The liquid krypton and xenon are absorbed onto silica gel or onto activated charcoal. They are then once again subjected to fractional distillation. The liquid mixture is warmed slowly until the krypton is transformed into a gas. The xenon has a somewhat higher boiling point and remains behind as a liquid. 8 The krypton is purified by passing it over hot titanium metal. This substance tends to remove all elements except noble gases. 9 For most purposes, the krypton is now ready to be packaged. For some scientific purposes, however, only one of the six stable isotopes of krypton is desired. To separate these isotopes, a process known as thermal diffusion is used. This process depends on the fact that the isotopes have slightly different densities. 10 The krypton gas is placed in a long vertical glass tube. A heated wire runs vertically through the center of this tube. The hot wire sets up a convection current within the tube. This current of hot air tends to carry the lighter isotopes to the top of the tube, where they can be removed. 11 Krypton gas is packed in bulbs of a strong glass such as Pyrex at normal pressure or in steel canisters at high pressure. Because it is a highly unreactive substance, krypton is very safe. It is nontoxic, nonexplosive, and nonflammable, so it requires no unusual precautions during shipping. The most important factor in the quality control of krypton production is ensuring that the final product contains only krypton. The process of fraction distillation has been developed to the point where it produces very pure products from air, including krypton. Random samples of krypton are tested for purity by spectroscopic analysis. This process involves heating a substance until it emits light. The light then passes through a prism or a grating in order to produce a spectrum, in the same way that sunlight produces a rainbow. Spectroscopic analysis is particularly well suited to studying gases, because heated gases tend to produce sharp, bright lines on a spectrum of pure krypton, it is possible to tell if any impurities are present. Krypton is only one of many valuable elements produced by the fractional distillation of liquid air. More than three-quarters of air is made up of nitrogen. Nitrogen is used to produce a wide variety of chemical compounds, particularly ammonia. Because it is much less reactive than oxygen, nitrogen is used to protect many substances from oxidation. Liquid nitrogen is used in freeze-drying and refrigeration. About one-fifth of air consists of oxygen. The steel industry is the largest consumer of pure oxygen. Oxygen is used to remove excess carbon from steel in the form of carbon dioxide. Oxygen is also used to treat sewage and to incinerate solid waste. Liquid oxygen is used as rocket fuel. The noble gases obtained from air other than krypton are argon, neon, and xenon. Argon is used in certain types of light bulbs. Passing an electric current through a glass tube containing neon under low pressure produces the familiar neon sign. Xenon is used in strobe lights to produce intense, short bursts of light. The future production of krypton is likely to be influenced by the future of nuclear power production. Because krypton can be produced as a byproduct of nuclear fission, nuclear power plants may become an important source of krypton in the future. On the other hand, if nuclear fission is largely replaced by nuclear fusion or by other forms of energy production, krypton is likely to remain almost entirely a product of the atmosphere. Asimov, Isaac. The Noble Gases. Basic Books, 1966. Atkins, P.W. The Periodic Kingdom: A Journey Into the Land of the Chemical Elements. Basic Books, 1995. Compressed Gas Association. 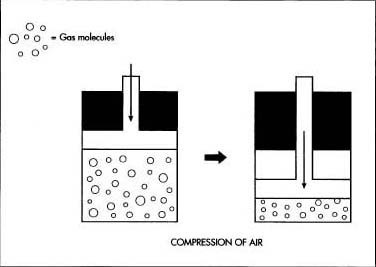 Handbook of Compressed Gases. Van Nostrand Reinhold, 1990. Produced krypton and boron are useful increasing the nuclear fission process in the nuclear reactor of the power plant or not. If it is useless in the reaction, how it is removed?